Atlas Orthogonal is a highly precise Chiropractic Procedure founded by Dr. Roy Sweat in Georgia. Dr. Sweat studied under Dr. Grostic who got his ideas about the importance of adjusting the C1 vertebrae with precision by Dr. B.J. Palmer. Dr. Palmer the developer of Chiropractic, dedicated 35 years to the study of this very important part of the anatomy. This area of the spine is theorized to be the centering point for all the righting mechanisms of the whole body. If this bone, C1 is not orthogonal (at right angles) with the neck and skull, many imbalances and diseases emerge in the body. There is an over-firing of the motor centers in the brainstem which lead to tighter muscles on one side of the body if the Atlas (C1 ) is not level or if it is twisted. Information going to the brain and back out to the rest of the body is weaker. The immune system and all other systems will have to work harder for the body to stay in balance. The Procedure of Atlas Orthogonal has been studied extensively by Dr. Sheehan, who will examine patients for this type of misalignment and then make recommendations about xrays and correction using physics, calculus and biomechanics. 3-D x-rays of the upper spine are needed to find the angles of correction. 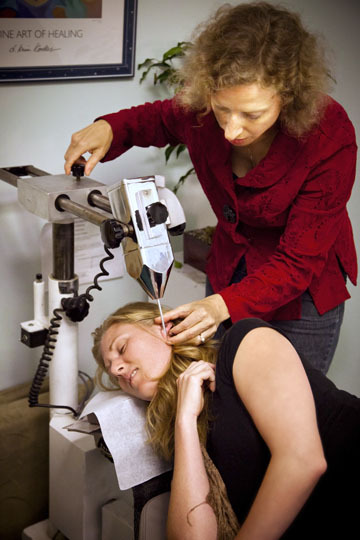 A highly specialized instrument makes the adjustment in a neutral position. There is no twisting or popping the spine. This procedure is highly effective in treating problems like herniated discs both lumbar and cervical, vertigo or dizziness, tinnitis, headaches, neck and rib pain, low back pain and TMJ dysfunction.